Crossens, part of the parish of North Meols, was a detached settlement, on the northern fringe of what is now Southport. Although never administratively independent, it always had a distinctive identity and has a history quite different from that of other areas of the town. 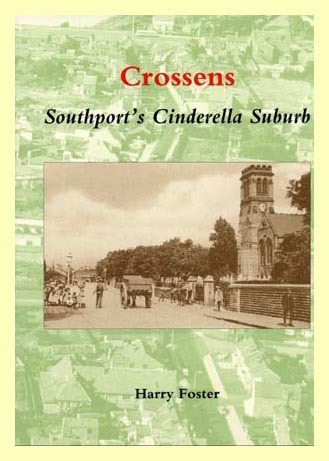 Farming dominated Crossens, but as Southport developed as a resort and residential town in the early nineteenth century, it became an out-of-sight dormitory for the town's poorest paid labourers and others whose poverty precluded them from affording more expensive property nearer the town. On the surface it is difficult to see why the borough of Southport should want to incorporate this socially depressed area in 1875. The answer was very basic - the town's need to secure access to the Ribble estuary for the discharge of its ever growing volume of sewage. It was in the closing quarter of the nineteenth century that Crossens was transformed through the impact of an energetic, socially active vicar - William Bulpit - who was materially backed by the landowner - Charles Scarisbrick. The early twentieth century saw the arrival of the Vulcan motor works, Southport's only major factory. Its arrival coincided with an upsurge in the confidence of the village community, demonstrated by the mounting of its impressive annual summer festival and the emergence of sports clubs that dominated the local scene. The local authority attempted to encourage and later promote further industrial development in Crossens, but enjoyed little success. More recently, the pressure to provide land for houses has meant that agricultural and industrial land has been used for this purpose. The physical gap between Crossens and its neighbours has been closed and Crossens has become another suburb, at the northern margin of the sea of residential development that is Southport. Please add £5.00 bank handling charge if remittance not in sterling .